Many of our blog readers need no introduction to Cliff Rosenthal. For those who might, Cliff is a nationally recognized expert in community development finance, a founding father of the CDFI industry and longtime credit union champion. For more than 30 years, he was CEO of the National Federation of Community Development Credit Unions (now Inclusiv). In the late 1980s Cliff wrote the concept papers that set the foundation for the CDFI Fund. In the 1990s, he was instrumental in founding—and then leading for 20 years—the CDFI Coalition. In 2012, Cliff left the Federation to launch the Office of Financial Empowerment at the recently created Consumer Financial Protection Bureau (CFPB). OFN has been anticipating this book, and we were thrilled when Cliff agreed to speak with us about it. We hope this is the first of many conversations. Over the years, I’ve had a kind of proprietary interest in the industry and have established relationships with a lot of the field’s key players. But, when you're working full time, it's difficult to take on a project of this magnitude. When my CFPB tenure was coming to an end in 2014, I woke up one morning and confronted the reality of having so much time. I don’t play golf, so what was I going to do?! It just sort of hit me: this is my life, my work. I basically decided to devote myself to this book. For the next couple of years, I got into the project. In my first career, I was an aspiring Russian historian. In lieu of a dissertation, in 1975 I published a book that was the great project of my early life. I had discovered a trove of memoirs of mid-19th Century Russian revolutionary women who were engaged in building a movement — a populist movement, a feminist movement. So, writing Democratizing Finance was like closing a great circle, becoming the historian I had never quite become in the past. What was your process for research and writing? I started with an outline. Everyone I showed it to said it was incredibly ambitious. But I thought, "Well, I know these are the logical things to do. I’ll just keep working and in a year or so I'll have something." What I found in the process was that one thing literally led to another. You'd turn up one stone and find a whole new area of inquiry. I was really working in two directions: one was thinking and looking at the long history — the problem of access to capital can be traced through 200 years of American history. I went back Benjamin Franklin and followed the field’s origins from there. And I also have a fascination with people's lives and what they make of them. I interviewed more than 200 people, including all past CDFI Fund directors, and learned so many wonderful stories. I only have been able to incorporate about a third of these people into this work because the book primarily runs through 1997. You were there when Clinton announced the CDFI Fund and then when he signed it into law. Take us back to that time. In the book, I really wanted to recreate this moment for people who were there and bring it alive for people who weren’t. It was July 15, 1993, six months into the first Clinton administration. It was a hot D.C. day, and we were in the Rose Garden. “We” were 50 to 75 CDFI practitioners, 41 members of Congress, secretaries of the cabinet, Vice President Al Gore, and President Clinton. There was a series of touching and powerful presentations — I talk about each in the book. Probably most memorable was by a man named Timothy Bazemore. Tim was a Self-Help borrower who organized a worker-owned sewing cooperative in rural North Carolina. Tim, an African American man probably in his 60s, looked around and said, "Here I am in the presence of the President of the United States... they told me only to talk for a couple minutes, but I'm never going to have this opportunity again." So, he told the story of what the loan had meant to him. It was amazing. This group of grassroots folks that gets funded on a draft proposal and a dream basically, and here we are all at the White House. Even now, I get chills. Then 15 months later, the signing of the bill was slightly different. It was raining, so we were moved inside to an auditorium. I wouldn't say we were old hands at that point — it was still absolutely momentous — but there wasn’t quite the overwhelming sense as that earlier day in the Rose Garden. You call the CDFI Fund one of the “greatest domestic policy success stories of the past half-century.” Without giving away the whole book, tell us more. For one thing, at a very basic level, look at the numbers. We started around kitchen tables, in church basements, and so forth. Today there are more than 1,000 certified CDFIs that, in aggregate, control more than $130 billion in assets. That’s astonishing. The other is that the fund’s was a troubled birth. The CDFI Fund was Clinton's program, and we were very excited when it launched. In a series of pitched battles with the Clinton administration, at two different points — 1994 and 1997 — Republican partisans almost, directly or indirectly, destroyed the CDFI Fund. All this to say, the survival of the Fund was not ordained. There were some difficult times. But it settled in, grew, and became legitimate. I think it's a minor miracle, given where we came from, that this Fund has gotten bipartisan support in the way it has in Congress. It is a huge accomplishment to establish an agency that essentially has been scandal free for 20 years. What other federal agencies can you say that about? What do you think accounts for this success? First, it’s a very clean program that works. Another factor is that the CDFI Fund’s innovation is it provides equity capital, rather than money for specific loans and projects. CDFIs are institutions that basically manage capital, and there haven’t been scandals resulting at their local levels. Over time, CDFIs spread across the country. 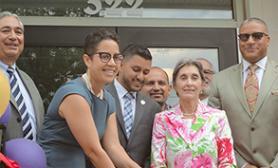 The Fund started funding only 32 organizations and grew over time. It was increasingly able to point to a growing number of Congressional districts where there were CDFIs. So, telling the story to Congress became much easier. Finding numerous policymakers who had a vested interest in something good going on in their district was a success factor as well. The other thing to say is that the field has engaged the private sector, particularly banks. In the early stages, banks were a little concerned that CDFIs might usurp their privileges and get something from the federal government that mainstream banks would not. But, in fact, CDFIs, particularly loan funds and micro funds, have built extensive relationships with banks. They’re seen as benign, if not helpful, to banks. It’s less true for credit unions, for reasons that I talk about, and venture funds. There is a debate as to whether CDFIs provide a fig leaf for banks to cover disreputable behavior. I also address this question in the book. So, has the CDFI field made mistakes? I don't think I would frame it this way for the field. Was there a mistake? In the book, I basically say that I believe the CDFI Fund got it wrong in some ways. In the statutory language, there are two guidelines to consider in the funding process: one, the degree to which an institution was or could become self-sufficient, and, two, the degree to which an institution was or had plans to become a depository institution — that is, a credit union or a bank. For the first 20 years of the Fund, 80 cents of every Financial Assistance dollar went to loan funds; less than 20 cents went to a combination of credit unions, banks, and venture funds. So, I would argue that the CDFI Fund got it wrong in that sense. Where the field may have fallen short is in developing minority leadership and in promoting community ownership of institutions. The issues of diversity and inclusion have become prominent ones, and I think people are making big faith efforts to address them. But my perspective is basically a left-wing populist one. From this perspective, the industry has not done as much as it could to empower people in low-income communities or to create a leadership that reflects those communities. I think it's beginning to change. I hope it's beginning to change. You’ve had a front seat to the start-up and early days of two agencies, the CDFI Fund and the CFPB. What can we learn from the former about persevering through fights for the latter? I think the answer lies in the degree to which the CDFI Fund has earned bipartisan support. The CDFI Fund isn’t a threat to banks. But enemies of the CFPB are broad; the CFPB is a battleground for all financial institutions. To my tremendous distress, banks and credit unions that I've spent my whole life working with have become enemies of the CFPB because they are so averse to regulations. This is not a problem that the CDFI Fund must deal with. The CDFI Fund isn’t a regulator. It has the creative potential to basically create good news stories and political support, so that it's clearly provided some insulation against the worst instincts of this administration. The CDFI Fund doesn't have any natural enemies, except those who want to obliterate any federal investments for community development and the poor. You are both a historian and a creator of the history you’re interpreting. Although no historical retelling can ever be completely objective, how did you balance playing this dual role? It was a challenge. For example, look at the chapter about when I basically took over a Federation that was bankrupt and then spent 10 years trying to rebuild it, dollar by dollar. That’s a personal story. It maybe feels out of tune with the rest of the book, but I thought it was a unique opportunity to tell the story. I knew I could interview other people about this period. But, essentially, I interviewed myself, which was hard, to provide what is hopefully an interesting perspective on being inside this growing movement. I also drew a few portraits of people who were important to the industry. These are people I’ve known. By interviewing them and others I tried to bring these portraits to life, putting aside any ad hominem stuff. I hope I was able to overcome the inherent biases I had as a practitioner. There are some really engaging and readable chapters, but, overall, it's specialty stuff, not for a mass audience. I hope those of us who have been in the field will read it. But while the book memorializes an era, it's really for younger generations of CDFI folks who weren’t there. It also resonates for entrepreneurial and social enterprise folks who want to get a sense of how to connect to the big stage. And I think it's important for policymakers to understand this history and the CDFI Fund better. I would also like people in banking to understand this industry a lot better. 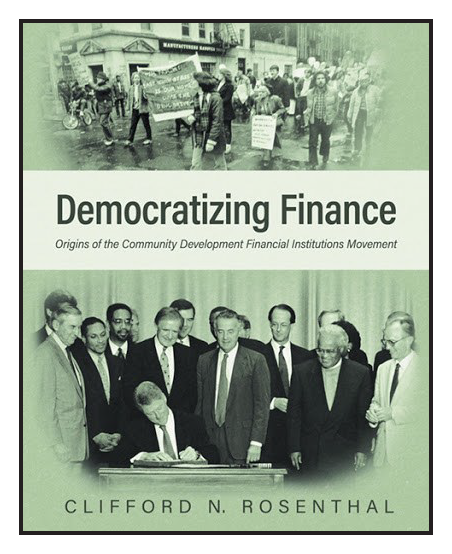 Democratizing Finance: Origins of the Community Development Financial Institutions Movement is available online at FRIESENPRESS BOOKSTORE; GOOGLE PLAY BOOKS; ITUNES BOOKSTORE; BARNES & NOBLE; AMAZON.